Fresh & Saltwater Aquarium Supplies. 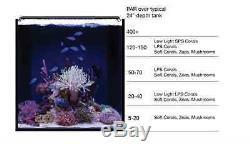 Current USA Orbit Marine LED Aquarium Light Reef Tank Saltwater Sps, Lps, Corals. 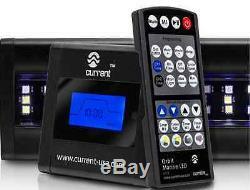 24-Hr Saltwater reef aquarium light with wireless remote controlled effects... Right from the start, there&###x2019;s a lot to love about the Current USA Orbit Marine. It&###x2019;s simple, yet fully controllable. Thin and sleek, yet powerful and bright. It can do things you never thought an aquarium light could do - all programmed from the comfort of your couch. Combining industry-first Dual Daylight and Dual Actinic LED spectrums with Current USA`s Ramp Timer Pro LED controller, the Orbit Marine creates a complete 24-hour aquarium lighting solution. Now you can simulate a gradual sunrise, sunset and customized moonlight like never before. Designed specifically for saltwater aquarium environments, the Orbit Marine is the perfect choice for marine aquarists at any level. Amazing control Featuring control and dynamic lighting aspects you&###x2019;ll have to see to believe, there is almost no limit to what you can do. The Orbit Marine includes our powerful Ramp Timer Pro LED controller with wireless IR (infrared) remote, providing two independent light channels to program: -&###xA0;&###xA0;&###xA0; 24-hr on/off time, ramp up and dim down duration (0-30 minutes) -&###xA0;&###xA0;&###xA0; Minimum and maximum intensity (0-100%), color adjustment -&###xA0;&###xA0;&###xA0; Adjustable moon light color, brightness and duration -&###xA0;&###xA0;&###xA0; On-demand weather effects including cloud cover, storm with lightning and fading moonlight Additional memory settings allow up to four customized lighting schedules you can access at any time with one touch. Current USA has even pre-programmed two common lighting schedules and two coral acclimation modes to make it easy for your corals to adjust to their new lights. The backlit LCD screen is a thing of beauty, easy-to-read, and makes it simple to program using the IR remote. Twice the spectrum, twice the effects The Orbit Marine packs plenty of power thanks to industry first Dual Daylight and Dual Actinic multi-chip LEDs. By incorporating two channels of dual color spectrums, Current USA has created a light fixture producing eye popping colors with vibrant shimmer. The combination of 8,000K/12,000K white along with 445nm/460nm actinic blue creates the perfect spectrum for marine fish, inverts, live rock, and corals to fluoresce like never before. Utilizing 120-degree lenses, the light spreads uniformly over your entire tank and color blends extremely well. Packaged in a sleek aluminum housing, the Orbit Marine is a brilliant lighting solution engineered for maximum tank enjoyment. Specifically designed for saltwater aquariums, the Orbit Marine features a high ratio of blue spectrum light. This higher ratio ensures corals and other photosynthetic organisms receive proper wavelengths for strong coloration and growth. Sliding docking legs allow quick and easy adjustments for a wide variety of installations. Easy-to-install, you can always add additional fixtures to your tank and operate them using a single remote. Low voltage, super safe LEDs... Low, 12V DC, IP65 rated LEDs making them super safe for aquarium use. 120 degree dispersion angle for optimal spread and color blending. Benefits - Dual Daylight and Dual Actinic spectrums for vibrant color, growth and shimmer - 24-hr gradual sunrise, sunset and moonlighting creates a natural rhythmic light cycle - Slow ramp up prevents light shock, gently acclimates fish to bright LEDs Features - Fully controllable, includes Ramp Timer Pro with wireless IR remote - Four color spectrums specific for marine fish and reef aquariums - Thin, sleek, aluminum housing - Plug-and-play, easy to program, internal memory - Adjustable docking mounts fit on a wide variety sized aquariums - Low voltage, 12VDC and IP65 water resistant, safe for aquariums Specifications - Fixture Size: 18" - Fits Aquariums: 18"-24 - Dimensions: 16.8&###x201D; x 3.5&###x201D; x 0.44&###x201D; - Power: 18 Watts - LEDs: 72 (36 dual-daylight/36 dual-actinic) Orbit Marine LED system Includes: - 1 Orbit Marine LED fixture - 1 Ramp Timer Pro with Wireless LED remote control - 2 Adjustable docking mounts - 1 12V DC UL transformer. &###xA0;Pictures of DOA must be Recieved within a hour of Package Arrival. We will Replace DOAs on next order. Customer Has to be home/business to recieve Live package - No exceptions. In case of any damages please notify us asap so we can help you file a claim with the carrier. The Orbit Marine includes our powerful Ramp Timer Pro LED controller with wireless IR (infrared) remote, providing two independent light channels to program: - 24-hr on/off time, ramp up and dim down duration (0-30 minutes) - Minimum and maximum intensity (0-100%), color adjustment - Adjustable moon light color, brightness and duration - On-demand weather effects including cloud cover, storm with lightning and fading moonlight Additional memory settings allow up to four customized lighting schedules you can access at any time with one touch. The item "Current USA Orbit Marine LED Aquarium Light Reef Tank Saltwater Sps, Lps, Corals" is in sale since Tuesday, March 01, 2016. This item is in the category "Pet Supplies\Fish & Aquariums\Filters". The seller is "reefspecialty" and is located in The Colony, Texas. This item can be shipped to United States, Canada, United Kingdom, China, Mexico, Germany, Japan, Brazil, France, Australia, Russian federation, Denmark, Romania, Slovakia, Bulgaria, Czech republic, Finland, Hungary, Latvia, Lithuania, Malta, Estonia, Greece, Portugal, Cyprus, Slovenia, Sweden, South Korea, Indonesia, Taiwan, South africa, Thailand, Belgium, Hong Kong, Ireland, Netherlands, Poland, Spain, Italy, Austria, Israel, New Zealand, Philippines, Singapore, Switzerland, Norway, Saudi arabia, Ukraine, United arab emirates, Qatar, Kuwait, Bahrain, Croatia, Malaysia, Chile, Colombia, Costa rica, Panama, Trinidad and tobago, Guatemala, Honduras, Jamaica.